We were looking for an estate sale and ran across this garage sale. I couldn't find anything interesting and the gentlemen was dismayed that I didn't have anything. I told him I didn't see any sewing things and he said, wait just a minute, I just didn't know what to do with this. You can have the whole box for $5. I think I hit the jackpot on cone thread. Both the electric and battery powers sissors work great. There is a picture of some different sewing feet that I am not familiar with. I am a Singer person so none of these look familiar to me. While I was emptying the box, I noticed on the side of the box was written, thread/keeper. I wonder if this gentlemen has sold something that his wife didn't want to part with. Those feet look like the ones for my 1970's era Kenmore. You got a really great deal - congratulations! Gotta love those garage sales! What fun! I love when. That happens. Enjoy! You got a wonderful deal--would love all those colorful cone threads ! Wow. Apparently he didn't know what he was selling. Hope someone isn't in the doghouse. I would feel so guilty at this point, if it's possible I'd get in contact with the wife and ask if that box was meant to be sold. Since the scissors alone were worth that, you did great! Wow! If his wife didn't want to part with it, I wouldn't want to be in his shoes. If that's the case he better be ready to fork over the credit card and see about having his limit hit the max. He might want to see about having his limit raised or give her a couple more cards. I think it probably belonged to a former wife as he had only been married about 3 months to his current wife. Those look like Kenmore feet. And I see you've got a walking foot too. Don't feel bad/guilty... enjoy your great purchase. If you keep them and aren't in need of them, check ebay for a pricing and sell them. There are often people who buy a machine with no feet and need to buy them. Oh I forgot to say nice score too! 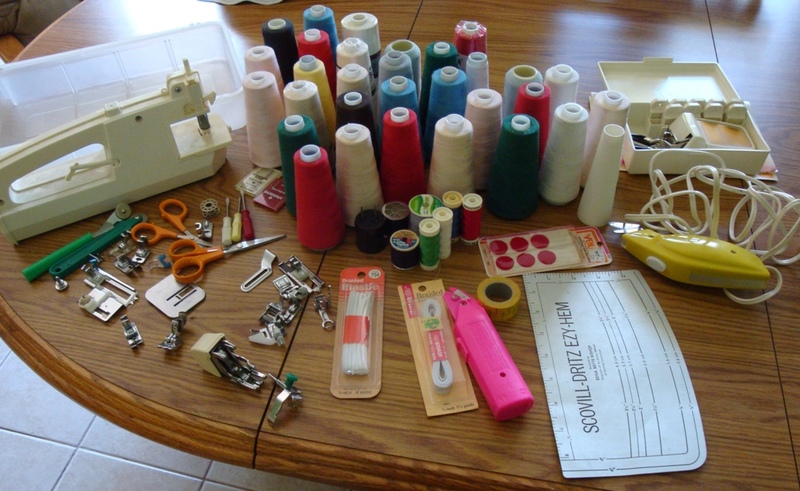 That is a lot of sewing notions for five bucks. OK, thanks for clearing that up, that does make sense. You did get a great deal. Me, too. I have known some men to be very unaware and insensitive to their wives' belongings. If the box was not out, it probably should not have been out. If someone had sold something I had set aside. I would have been furious. For years. I'm with you. I was thinking the same. I would have to go back and ask wife. What a fun find! Congrats! I know that metal hem presser is more than $15, that's why I haven't bought me one! SCORE, but I hope that guy didn't mess up and sell something he wasn't sposed to! He may be in the doghouse for a long time! You scored. On the second picture, the rectangular foot with 5/8 on it is a button hole foot. The one on the far right with the white plastic back is a walking foot. 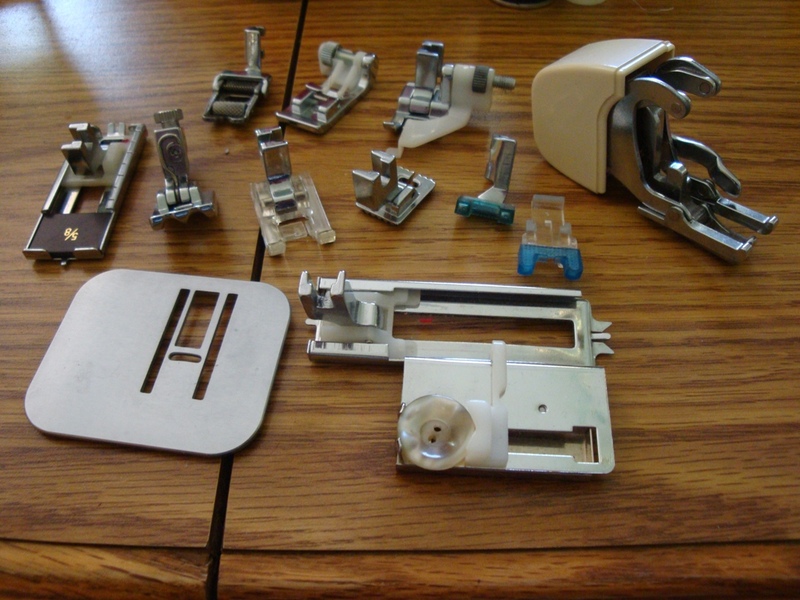 I'm sure if you look at Kenmore or Janome (My older Kenmore was made by Janome) feet for sale you will be able to identify all of them. Some of those feet look like some that go to my brother. Are you interested in selling the feet? Second wife may also be interested in sewing. Sorry about raining on your parade - but - I still think the right thing would be to go back and check with the WOMAN!